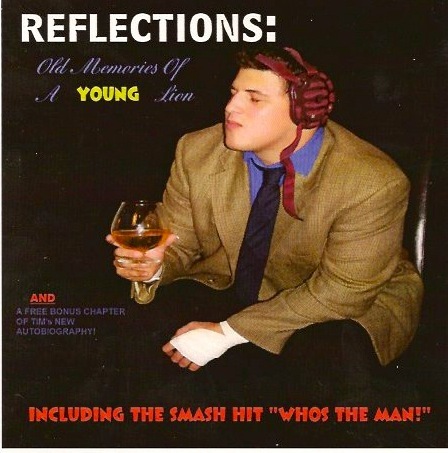 In preparation of Tim Donst’s upcoming interview on From the Rafters Radio, I decided to finally review Tim’s self-produced CD that I bought at the Chikara show in Chicago Ridge. The CD is cleverly titled, Reflections: Old Memories of a Young Lion, playing off Tim Donst being a former Chikara Young Lion’s Cup winner. Before I get into thoughts on the nine tracks, I want to get the harshest criticism out of the way. The audio levels leave a lot to be desired. I’m guessing Tim recorded this at home on his computer or cell phone or some type of recording device that wasn’t a professional studio. There’s little consistency in volume level from track to track and some of the tracks are over modulated. If you get past the amateur audio though, this is a highly entertaining CD. The first track is entitled Free Bonus: Chapter 36 of Tim’s Biography. This is Tim reading a chapter talking about his youthful days and a game of tag with friends. A simple game of tag leads to a backyard tickle fight/wrestling match against Tim’s nemesis Betsy Palmer. I won’t ruin the ending of the story, but will say the purpose of the story is to show Tim had a Rudo side to him even as a child. From there the CD segues into the first song called “Do the Donstaroo.” It may just be me but this reminded me of the Bloodhound Gang’s, “The Bad Touch.” Of the five songs on the album, this is the weakest. Tim shows his versatility on track 3: Open Mic Night Standup. As the title implies this is Tim doing a comedy routine. Donst has some good jokes including one about dating a girl who was such a bad cook she burnt his Eggo and wondering if Chuck Taylor also dated her and if she was the inspiration for Chuck’s finisher, the Awful Waffle. Based of this track if Tim ever comes to Hollywood and performs at the Laugh Factory or Comedy Store, I would definitely go to the show. Track 4 should already be on everyone’s Ipod. It is Tim’s multi-platinum hit song “Who’s the Man?” If you’ve been living under a rock and aren’t familiar with the song here’s the YouTube video. 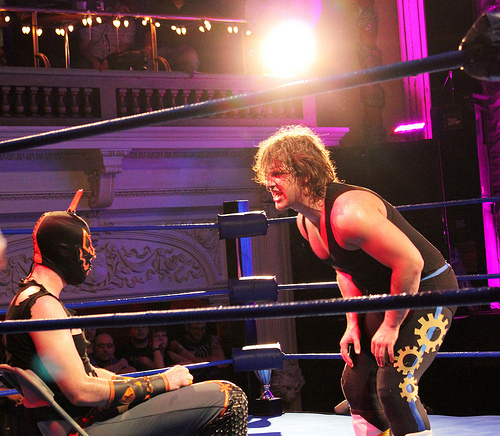 A running theme through most of the tracks is Donst’s obsession with proving he’s the best Young Lion’s Cup Champion and especially better than Hallowicked. On Who’s the Man” Hallowicked shows up at the end to give his thoughts on the matter. After the greatness that is “Who’s the Man,” Tim goes into another story. This one dedicated to former Chikara Director of Fun Leonard F. Chikarason’s son. “The Talk” offers words of advice to the young Chikarason about being careful when it comes to women and trusting them and keeping them away from your tag team partner. The ending to the story is pretty entertaining. Track 7, “voicemails from Easton from 1.28.11 with Jakob Hammermeier.” This is a series of voicemails Jakob leaves on Tim’s phone. The weakest track on the CD and could have easily been left on the recording room floor. 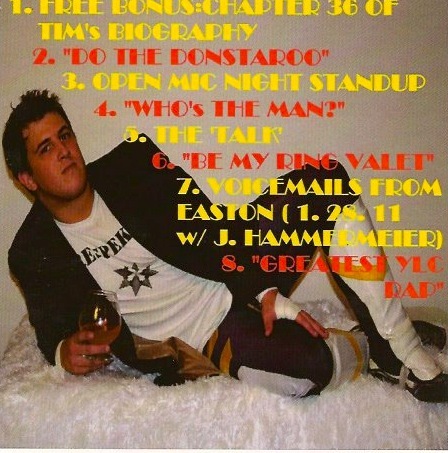 The CD ends with my personal favorite track, “Greatest YLC RAP.” Comparable to Billy Joel’s, “We Didn’t Start the Fire,” Tim runs down the events of his Young Lion’s Cup reign. Detailing all the opponents he bested while working in shots at Hallowicked. Honestly how can you not like a song that includes the line, “Hallowicked you’re Screech and I’m Zack Morris. All my Donstaroos sing the chorus.” A fine closer to the CD if ever there was one. I don’t know if all CDs feature it but my copy has a hidden bonus track called, “Knockin’ on Wink’s Door.” Since current Chikara Director of Fun Wink Vavasseur wouldn’t listen to Tim’s request for a match with Hallowicked, Tim decided to put his request into song form. It seemed to pay off as Tim and Hallowicked squared off at Chikarasaurus Rex 3. When I purchased this CD I did so more as a novelty and didn’t expect much from it. With the exception of the Voicemail track and “Do the Donstaroo” this turned out to be a highly entertaining and catchy CD. I think on the road trip from Chicago to Lafayette, Indiana to Marion, Illinois we must have listened to this four or five times. There are a lot of Chikara references so someone who isn’t as familiar with the past three years of Chikara storylines probably won’t appreciate the stories and songs as much as die hard Chikara fans, Still there’s a lot worse CDs you could be listening to. Seriously, listen to “Who’s the Man” and if you don’t find yourself humming it or singing along later in the day, I’d say you have no soul. I don’t know if Tim is still selling copies at live events he’s booked on, but if you want a copy, you can always hit him up on Twitter @tdonst and ask how to obtain a copy. The holidays are coming up and this would make a great present. After you buy Reflections: Old Memories of a Young Lion let us know on our Facebook page. Want to hear from satisfied buyers.